OR AS LONG as I have been attending the classical Roman Rite of Mass, I have always loved the Asperges at High Mass on Sundays. It is simply a beautiful and fitting way to begin the liturgy―an act that is utterly and obviously ordered to preparing the people to worship in a more holy manner by recalling their minds to their baptism and by affording an occasion for the forgiveness of sins. The liturgy commences with an act of blessing, bestowed at the hands of the priest―a visible image of the showering of divine graces throughout our lives as Christians, and a foreshadowing of the sublime outpouring of grace in the Holy Sacrifice of the Mass and Holy Communion. It seems that they are not, for the following reasons. 1. It is proper to the sacraments of the new law to confer grace. 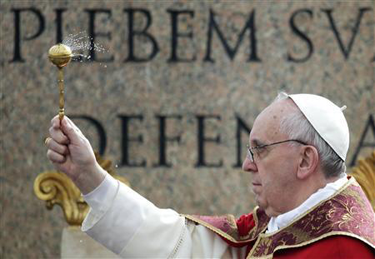 But the aspersion of holy water and the like are not said to be sacraments. Therefore they do not confer grace: consequently no remission of fault is brought about by them. 2. Mortal sin cannot co-exist with grace, with which however venial sin can co-exist; and consequently an infusion of grace suffices for the remission of mortal sin, but not for the remission of venial sin; therefore it seems that more is required for the remission of venial sin than for the remission of mortal sin. But mortal sin cannot be remitted by the aspersion of holy water and the like, therefore much less can venial sin. 3. Venial sin is remitted by an act of charity. But an act of charity cannot be caused by the aspersion of holy water and the like but arises from within. Therefore venial sin cannot be remitted by the aspersion of holy water and the like. 4. Aspersion of holy water and other such actions are related equally to all venial sins. If then one venial sin is remitted by them, with equal reason all are remitted; and therefore if they are remitted so far as concerns fault, those who are without mortal sin can repeatedly say “we have no sin,” which is contrary to what we read in 1 John 1:8; and if by such actions sin is also remitted so far as concerns punishment, most people will go straight to heaven immediately after death without suffering the punishment of purgatory, which does not seem reasonable. Therefore venial sins are not remitted by the aspersion of holy water and the like. ON THE CONTRARY: Nothing in the observances of the Church is done in vain. But in the blessing of water mention is made of the remission of fault. Therefore some sin is remitted by the aspersion of holy water; but not mortal sin, therefore venial sin. Response: As was said above (in q. 7, a. 11), venial sins are remitted by the fervor of charity: and therefore whatever is naturally suited to arouse the fervor of charity can cause the remission of venial sins. Now an act of charity pertains to the will, which is inclined to a thing in a threefold way: sometimes by reason alone presenting the thing, but sometimes by the reason together with an interior impulse, which is from a higher cause, namely God, and sometimes even along with this by the inclination of an inherent habit. There are then some things that cause the remission of venial sin inasmuch as they incline the will to a fervent act of charity in the three aforesaid ways, and thus venial sins are remitted through the sacraments of the new law: because even reason regards them as certain salutary remedies and not only does the divine power in them in a hidden way work salvation but even the gift of habitual grace is conferred by them. Yet there are other things that cause the remission of venial sin in two of the aforesaid ways: for while they do not cause grace, they do stimulate the mind to consider something which stirs up the fervor of charity; and also it is piously believed that [on the occasion of their use] divine power works inwardly by stirring up the fervor of love. And in this way, holy water, the bishop’s blessing, and other sacramentals of this kind cause the remission of venial sin. There are still other things that cause the remission of venial sin by stirring up the fervor of charity solely by way of reflection―for example, the Lord’s Prayer, striking the breast, and the like. Reply to 1. For the remission of venial sin it is not necessary that new grace be conferred, and therefore venial sin can be remitted by something that is not a sacrament. Reply to 2. Without the fervor of charity, new grace is not infused in a person having the use of free choice; hence more is required for the remission of mortal sin than for venial sin. Reply to 3. The aspersion of holy water and the like cause the fervor of charity by inclining the will itself, as was said in the Response. Reply to 4. Although the aspersion of holy water and the like are related equally to all venial sins, nevertheless the fervor aroused by them is not always equally related to all venial sins, but sometimes that fervor relates to some venial sins in particular and works against them more efficaciously; and if the fervor of charity relates to them in general, it may not have the same effect in all, because sometimes man’s affection is habitually disposed to commit certain venial sins, so that if they were remembered they would not be displeasing, or perhaps if the opportunity were present they would be committed; and indeed it rarely happens that men living in this mortal life are free from affections of this kind. Hence we cannot confidently say “we are without sin.” And if by these remedies man obtained even for one hour immunity from all venial sins so far as concerns guilt, nevertheless it does not follow that he is freed so far as concerns all punishment―unless perhaps the fervor of his love is so great that it suffices for the remission of all punishment. So, the next time you attend High Mass and begin to hear the Asperges chant and watch the priest walk down the aisle with the aspergillium, ready to sprinkle you, remember that this devout use of holy water remits your venial sins and even assists you to serve the Lord better at the Mass about to begin, by stirring up your inward charity. Let us take hold of this moment as best we can and invest ourselves in its full meaning.